'Technology is our religion and quality is our motto which is the driving force, motivating the society to work with total commitment towards excellence in every endeavour,' is the principal thought that sows action at KIET Group of Institutions, located in the Ghaziabad district of Uttar Pradesh. The institute has made significant contributions with its humble beginning since 1998. Adding yet another feather to its crown, "Recently, we have launched KIET E -learning Portal with an objective to facilitate students by providing a learning platform through the availability of notes, chat server facility and videos i.e. Digital Learning Centre for students," points out Dr. J. Girish, Director, KIET Group of Institutions. The Department of Computer Applications was established in 1999, is best known for the excellence of its teaching in the dynamic discipline of computer application, and enjoys a rich heritage with 1500+ alumni. With an intake of 120 students, the Department is one of the preferred destinations among affiliated institutes of Dr. A.P.J Abdul Kalam Technical University offering programs in computer application. Industrial exposure and learning beyond the curriculum make KIET students more professional and complete for industries. Classes at KIET are equipped with projector, white board, projector screens and many more for effective classroom teaching through animation and power point presentations. "We focus on skill based education, as we believe that if you teach a man a skill, you enable him for a lifetime," adds Dr. Girish. The institute gives utmost importance to its lab facilities where students get an opportunity to explore theoretical concepts and applications. Students and faculty members have easy access to NPTEL for video lectures. The course focuses not only on syllabus coverage, but also emphasizes on student's hands-on experience by making projects on current technology. The tutorial and remedial classes are conducted for better course delivery. The summer and winter schools on advance technologies are conducted so as to bridge the gap between academia and industry. Apart from classroom teaching, the students are associated with project development using latest technologies under the supervision of faculty members. The students also run various technical hobby clubs to showcase their talent. The students participate in curricular and extra-curricular activities for their overall personality development including soft skill training. The institute has full-fledged theatre with 650 capacity, gym, temple, sports facilities and hobby clubs. To ensure maximum participation of students, the institute conducts multiple events and activities round the year. The Department stresses on industry interaction and practical exposure to the students on their field of expertise. KIET has tie-ups with CISCO Academy for conducting the CCNA, Oracle India Private Limited, Microsoft IT Academy and many more. The department has signed MoU with C# Corner intending to help with technology transfer, industrial visits for the students and faculty members, invited talks on recent technologies and workshops. Industrial exposure and learning beyond the curriculum make KIET students more professional and complete for industries. Placements in the campus have also seen students being successfully placed in reputed organizations. Names such as Cognizant, TCS, HCL, Matrix Exzac and many more are associated with the alumni of the department. The institute is actively associated with research and projects involving the students under the guidance of faculty members. The faculty members of the department undertake a number of sponsored research projects and consultancy projects. "Our alumni are connected through 'Alma Connect' wherein every year we go for Alumni Meet, where alumni participate. They interact with the faculty members and students - share their experiences, talk about the current technology, current market trends and many more. Some of the alumni are also connected through Social Media such as Facebook, LinkedIn and so on. 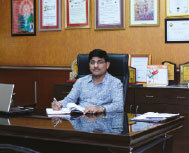 KIET started an outreach program in which KIET officials visit major cities to connect with alumni," mentions Dr. Girish. The institute seeks to develop in each member of its organization the ability and passion to work wisely, creatively and effectively for the betterment of humankind. It has a promise to impart futuristic technical education and instil higher values, making the students technologically superior and ethically strong. Dr. Girish has obtained his Doctoral degree in Civil engineering with specialization in Structural engineering from IIT, Kharagpur. He has more than 23 years of industrial, teaching and research experience. Among his achievements, some notable one's has been receiving best teacher award in the year 1999 at VIT, Vellore; he has coordinated TEQIP project for three years, funded by World Bank, has delivered invited lectures at NSTL (DRDO Ministry of Defence), NTPC, Noida and Chaired conference proceedings at NIT Warangal and many more. He has outstanding publications in peer reviewed journals-ASCE Engg. Mechanics, ASCE Aerospace Engg. ASME Applied Mechanics, Jnl. of Sound and Vibration, Composite Structures and Jnl. of Thermal Stresses.